The purpose of this report is to examine the projected housing needs of the San Diego Region and to stress-test whether existing plans and zoning established by each of the incorporated cities and the unincorporated County of San Diego provide sufficient and appropriate housing counts to accommodate future demand. 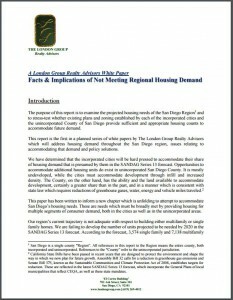 This report is the first in a planned series of white papers by The London Group Realty Advisors which will address housing demand throughout the San Diego region, issues relating to accommodating that demand and policy solutions. We have determined that the incorporated cities will be hard pressed to accommodate their share of housing demand that is presumed by them in the SANDAG Series 13 forecast. Opportunities to accommodate additional housing units do exist in unincorporated San Diego County. It is mostly undeveloped, while the cities must accommodate development through infill and increased density. The County, on the other hand, has the ability and the land available to accommodate development, certainly a greater share than in the past, and in a manner which is consistent with state law which requires reductions of greenhouse gases, water, energy and vehicle miles traveled. This paper has been written to inform a new chapter which is unfolding to attempt to accommodate San Diego’s housing needs. These are needs which must be broadly met by providing housing for multiple segments of consumer demand, both in the cities as well as in the unincorporated areas.